It is a hot day in June and I am on the ancient street of Mese or the Divan Yolu as it was called during the Ottoman times. I don't know what the road is called here where I am standing now because it changes names in every district of the old city. What I know is: it isone the oldest streets of the world with four or five civilizations’ residue lying under it’s layers. The road once started in the vicinity of the Hagia Sophia, where the center of the world was believed to be, and where all roads started at ground zero at the “Arch of Million”. The old road once passed by the Byzantine Palace of Mangana, where later the Ottomans built the Topkapi Palace, where the Goth's Column, the Constantine Column, the Hagia Sophia, the Hippodrome, the Blue Mosque, the Serpentine Column, the Egyptian Obelisk, the Underground Cistern; in short all of Byzantium and old Istanbul once lived and existed. The Mese continued from here through the Forum of Constantine( Çemberlitaş) to the Forum of Theodosius ( Beyazıt) and then at the Forum Amastrianum (Aksaray) where it split in two directions. One branch would stretch south-west towards the Marmara Sea all the way to the Dungeons of Yedikule where once the Golden Gate or Porte Arora witnessed the victorious Byzantine Emperors homecomings. The second branch would curve south of Aqueduct of Valens towards west going by the Church of Holy Apostles (Fatih Mosque) all the way to the Gate of Charisius(Sulukapı) of the Theodosian Walls. Today, it is still crowded with people, cars, taxis and the metro-trams running thru the median. My plan on this hot day in June is go thru the old road , take the metro-tram, but mostly walk, and to see some of the check points listed on my agenda; The Mosque of Laleli and the adjoining Taşhan, the mosque and the tomb of Mehmet the Conqueror in the Fatih district and the Column of the Marcianus; commonly known as the “girl column“. I boarded the metro from Eminönü, using my "Akbil"* and got off at Laleli, by the ancient forum of Amastrianum. After visiting the Laleli Mosque and the nearby Taşhan or Çukurceşme, an old two story Bazaar, I am in search of the street of Mese again. Going through Aksaray, and climbing uphill I found the old road and visited the splendid Şehzade Mosque built by the master architect Sinan, then taking pictures of the Aqueduct of Valens above the golden Horn, and walking under the hot sun kept looking for the Mosque of Mehmet the Conqueror. The road which leads to Fatih district is one of the most conservative areas of the city; but to my pleasant surprise it is sort of a Rue de Pera* of it's own kind, where religious bookstores are neighboring boutiques, stores displaying women's swimsuits in their windows and several restaurants and kebab houses next to them. One of every three women walking on the street here seems to have a head scarf on and one in hundred a black veil, but the girl friend or even sister accompanying the girl with the headscarf, is often wearing a colorful blouse a skirt or blue jeans with her hair neatly done at a coiffeur. As I walked on the street checking everything with interest, I saw a crowded side street going down hill towards the Sea of Marmara, and where the street reaches a plateau in a small center there rises a Byzantine column. Following my instincts I walked down hill towards the little square which was opening to several side streets. The column in the middle of the piazza looked like about ten or twelve meters high, two modern dressed girls were talking to each other next to its base . As they left another young woman with her blond hair freely hanging over her shoulders stepped on the pedestal of the old column, talking on the cell phone perhaps to her boyfriend. I had no doubt in my mind now that this was the famous "Girl's " or "Maiden" Column, not to confuse with the Maiden or Leander's Tower, one of the main landmarks of Istanbul. 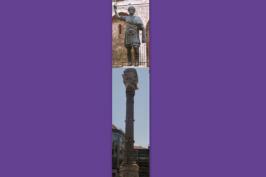 The column is believed to have been erected in honor of the Byzantine emperor Marcianus in 455 A.D. Some believe it is called the girl's column because of the Nike symbol on it's pedestal. Others claim, that it was another column in the same neighborhood with the statue of Venus on it, which played a role in rituals in finding out if a girl was a virgin or not, hence the column was called the girl’s column. When later the column of Venus disappeared, people often confused the existing Marcian column with the Venus column which ceased to exist. In any case the Marcian column is still there today in one piece, sixteen centuries later without the statue of Marcianus on top. We will talk about the statue, but first the column itself : A ten meter high red and gray colored granite column with a Corinthian capital decorated with eagles, a symbol of the Byzantium, and with a partial base of the missing statue on top. The column stayed in it's current place all in tact with the Emperor standing tall, until some time in the Thirteenth Century when Constantinople was sacked by Venetian Crusaders and the Marcianus statue was kidnapped to an unknown location in Italy among other valuables * After the Ottoman conquest of the city in 1453 the column was kept in it's original place surrounded by mansions and cypress trees. At one point it was believed to be used as the camping grounds of the Janissaries, the elite force of the Ottoman Empire. 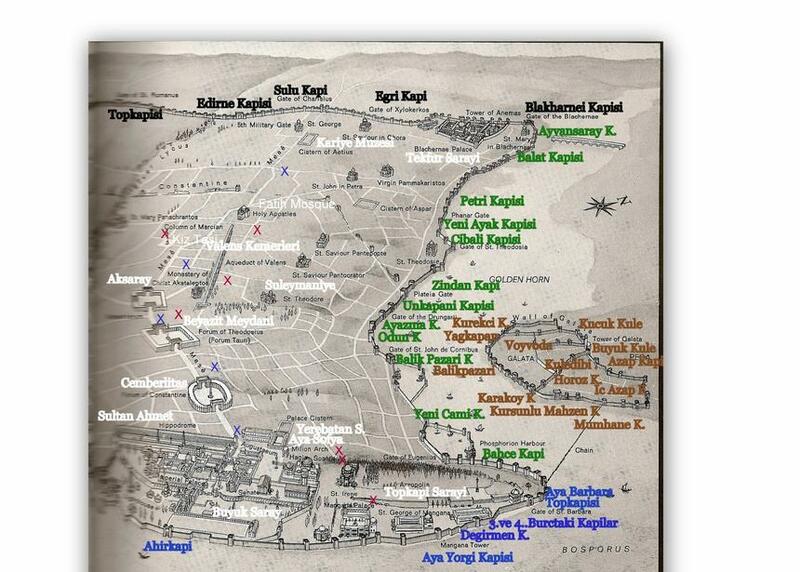 Since it was hidden from the public view, it even escaped the careful eyes of Peter Gilius, the 16 Century traveler who had recorded every inch of Istanbul in his travelogue. * Then in 1908 when Istanbul had one of the biggest fires of the century, the so called fire of "çırcır ", all it remained from the palaces and military installations was the Marcian column itself, once again open to the public eye. Having discussed the column in detail let's ask us the question; what happened to the Emperor's statue? One possibility is that it fell down during an earthquake, just like the Constantine statue few miles down the road on the same ancient street of Mese, and was destroyed and never replaced. The other theory is that when Constantinople was raped and sacked by the Venetian Crusaders in 1204, many valuable possessions like the famous quartet horses of San Marco were kidnapped to Venice* and other parts of Roman Empire. 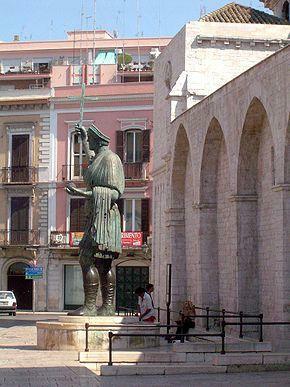 One such statute, which the locals call the "Giant" exists in the town center of Barletta, Italy . The five meters tall statue is believed to represent an Eastern Roman Emperor although his identity is subject to speculation : Theodosius II, Honorius, Valentinian I or Marcianus ? It could be any one of these Byzantine emperors, which once stood on columns near the ancient street of Mese and all of which do not exist today. Apparently after the fourth crusade a ship loaded with Constantinople's valuable possessions sank near the Italian shores and the giant statue washed ashore. The arms and legs of the statue were used for years by the locals of Barletta to cast bells. In the fifteenth century the head and torso of the unknown emperor's statue were erected on a pair of new legs and the missing arms were also added to the torso. We all know that benefit of winning wars in the past was bringing everything of historical or monetary value back home as a souvenir of the day. The quartet horses of Venice's church of San Marco once belonged to Constantinople, Istanbul's, Egyptian Obelisk belonged to Egypt, the Serpentine Column to the Island of Delphi. There is probably more of Troy to see in the museums of Austria than in Turkey and more of Halicarnassus Mausoleum( one of the seven wonders of the ancient world), in the British museum in London than in the town of Bodrum, Turkey, and more of Pergamum in Berlin than in Bergama, Turkey.. The prominent Turkish writer and founder of modern Bodrum(Halicarnassus), Cevat Şakir Kabaağaclı aka" Fisherman of Halikarnas" once asked the officials of the British museum to return back all historical valuables of the city back to Bodrum. He said ; it will look and fit better under the blue skies of the Aegean than the cloudy and rainy skies of London. The British museum officials responded that they will gladly paint the ceiling of the Halicarnassus Gallery in the museum with a turquoise blue color. We don't know if the statue of the Byzantine Emperor in Barletta likes his new home better than the one he had once on a column in the Byzantine city. But the sun in Italy is as hot and the sky is as blue as it is in Istanbul. 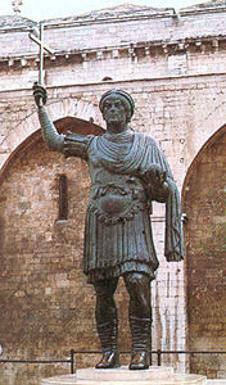 And the statue lived in Barletta, Italy as long as he lived in Constantinople, if not longer. So one can assume he probably likes his new home. We don't know for sure if the real identity of the "Giant" is that of the Emperor Marcian. But in any case even if he is not Marcianus, he was a Byzantine Emperor and we thought we will show you how he would have looked on the "girl column" in the Fatih district of Istanbul by creating a collage of the two. *Akbil, is the metal scanner ticket which can be bought at Akbil ticket stations by the bus and ferryboat stations. Once you buy the metal ticket it can be reloaded as it is used on train, bus, ferry -boat, metro, sea -bus and metro- bus for any denomination. One fare usually costs anywhere from .75 to 1.25 TL and is deducted from the total as you scan the ticket. Ak-bil means the smart ticket, "AKıllı" is smart in Turkish and BIL comes from the French word "bilet", meaning ticket. *Rue de Pera or Cadde-i Kebir or Beyoğlu or Istiklal Caddesi is is one of the main streets in Istanbul situated in the old Pera district, where most of the movie theaters, patisseries, bars, restaurants, churches and boutiques' are located.